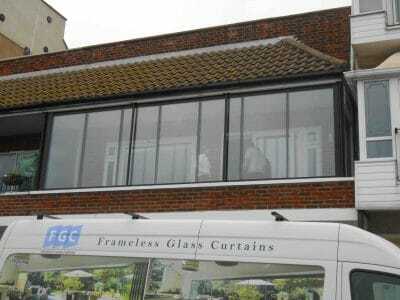 Our versatile range of frameless slide and fold or fixed glazing can create a new space for any house or apartment with a balcony, terrace or roof garden or verandah. If you have any kind of outside space and are thinking about making it usable all year round, talk to us about how we can customise our innovative frameless system to create stunning balcony enclosures. Frameless balcony enclosures to create a new space in the home. Our bespoke frameless balcony enclosures give your home a new level of comfort, usability and desirability. Available as a fixed, or retractable system, you have the option of closing off an outside area with the option of a fully or partially retractable system. When incorporated into our slide and fold system, the area remains sealed during the winter and can be fully opened in the summer. Benefits of frameless balcony enclosures and screens. Enjoy your outside area all year round. Protection from the weather and outside noise. Create a new sunroom on a balcony or a rooftop enclosure. Minimal framing and no visible mullions. Flexible opening options to suit your requirements. For flats or houses joining neighbouring properties, you can even choose from an obscure glazed option on the appropriate side to provide extra privacy with no loss of light. 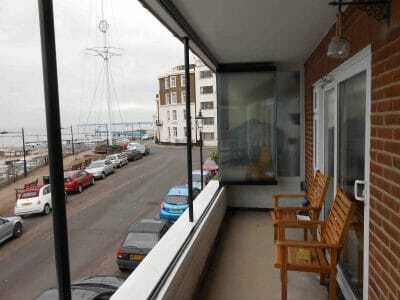 Balcony enclosures with low maintenance and easy cleaning. Our slide and fold system also makes cleaning simple and efficient thanks to the clever way each panel slides and turns, ideal for any high-level areas. We use quality powder coatings for the aluminium frames to the perimeter of the product. Powder coating not only gives you endless colour choices but also protects your new balcony enclosure and will look good for years. Only routine cleaning with a mild soapy solution is required. Customise your new frameless glass enclosure. Over 150 RAL colours to choose from. Choice of locking system and window handles. Fixed or slide and turn system. Can open in or out, slide to the left or the right. Our frameless system is designed to create wider and taller panels than most full framed systems so you can even incorporate full height doors if required. Contact us today for a further information and free quotation.